A state-of-the-art computer laboratory with 20 computers and internet facilities was donated to Royal College, Polonnaruwa, recently under the innovative ‘e-Thilina’ initiative, corporate social responsibility (CSR) collaboration between ESOFT and Sirasa Television. 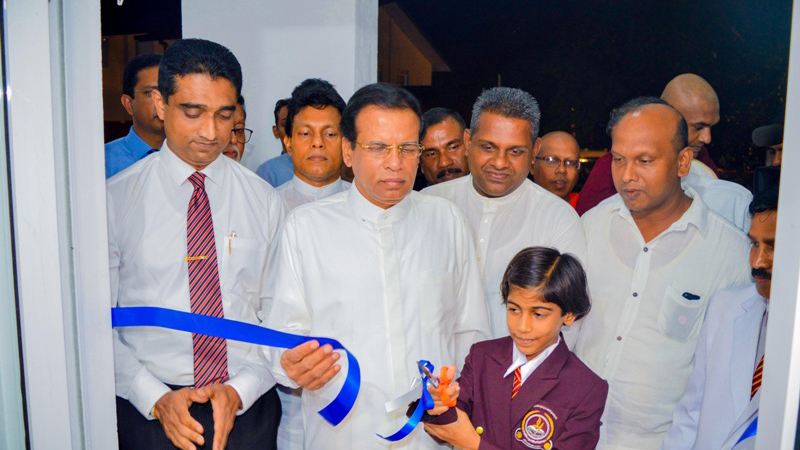 The ceremonial opening was held recently under the patronage of President Maithripala Sirisena who also declared open a new three-storied building for class rooms and an auditorium which were constructed under the ‘Rajarata Navodaya–Pibidemu Polonnaruwa’ District Development Programme. Other distinguished attendees included Dr. Dayan Rajapakse (Group Managing Director - ESOFT Group of Companies), Nishan Sembacuttiaratchy (CEO - ESOFT Metro Campus), Upul Dassanayake (General Manager - ESOFT Metro Campus Colombo), Harsha Ravindra (Assistant Manager - Branch Operations - ESOFT Metro Campus Colombo), Dr. D. S. A. Jayasinghe (Business Partner - ESOFT Polonnaruwa), R. M. A. C. Rajakaruna (Branch Coordinator - ESOFT Polonnaruwa), Sachithra Wanninayake (Branch Manager - ESOFT Kurunegala), Daminda Nissanka (Sales Manager - MTV/MBC) and K. K. Siripala (Principal - Royal College, Polonnaruwa).Expressing his views on the initiative, Dr. Rajapakse said, “As the pioneer IT education provider in Sri Lanka, we remain committed to increasing national sustainability by boosting the uptake of technology skills across the country. I feel that this is the only way we will develop our people, businesses and services to meet the standards set by neighbours like India and Singapore. IT is making its presence felt in every aspect of our lives; so, in order for us to progress as a nation, each of our citizens need to be given the opportunity to learn this important set of skills, especially those in rural and underprivileged areas so that they can create better futures for themselves and their families”. Under the e-Thilina project, schools are invited to submit a request through Sirasa Television where they are first evaluated to ensure access to an IT teacher, strong student interest in IT and the availability of space to house a computer laboratory. Once a school is selected, all equipment and infrastructure is transported, set up and configured in the school premises by ESOFT, resulting in a fully equipped lab which students and teachers can start using and benefiting from immediately. The core purpose of this ongoing community service endeavor is to ensure that every child gets the opportunity to achieve basic IT literacy and therefore, a chance at a brighter future. The very first e-Thilina recipient school was Kumbukwewa Maha Vidyalaya in Kurunegala in October 2014. In the last three years, e-Thilina has donated 28 computer laboratories to government schools islandwide. As the largest private sector higher education network in Sri Lanka with an islandwide network of 40 branches, ESOFT creates opportunities for over 30,000 students every year. Founded in 2000, ESOFT today has a solid reputation for delivering high quality and affordable academic programmes ranging from certificate to postgraduate level, across a variety of disciplines including computing, business, hospitality, engineering, quantity surveying and languages. Visit www.esoft.lk.